a better responsiveness with a new processor, the Expeed C2. Let’s now see what level of image quality the P7100 can reach. First of all, it’s interesting to compare the P7100 with the P7000, its predecessor and the Canon G12, its “official” competitor. As expected, with the same specs, the P7100 and the P7000 reach the same level of image quality. If we compare with G12, both models are close with a small advantage for the P7100. But, the overall score of the G12 comes out better. This is easily explained by the very low sensitivity settings available on the G12 (down to 50 ISO), where the quality is naturally very good. This gives some good marks to the G12 and gives it an advantage for the overall score. So, with the P7100, Nikon corrected the main glitches of the P7000 (usability and responsiveness) and maintained the image quality. But, will it be enough to compete with the new models launched recently. 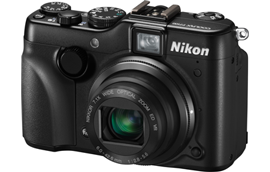 For example, if we compare the P7100 with its new Interchangeable-Lens cousins, the Nikon J1 and V1, we see that the Nikon J1 and Nikon V1 get a sensibly better image quality. It is easily explained by the sensors size difference. These 3 cameras have the same sensor resolution (10 Mpixels) but the J1 and V1 sensors are bigger. This gives them a lower pixels density and a big image quality advantage. In this comparison with the Olympus PEN EP3 and the Panasonic G3, the P7100 suffers from the same disadvantage as the previous comparison: its sensor size. As an overall conclusion, the P7100 seems to be better armed against its compact competitors. But, the arrival of the Interchangeable-lens category will certainly impact the Coolpix P7100 and the whole high-end compact market thanks to its good quality/size compromise.